The technological advances in power juicers in recent years have been enormous. It seems that every manufacturer is attempting to invent a revolutionary new method of extracting nutritious juice from fruit and vegetables to set themselves apart from the competition. However, any juicer that’s worth its money still has to deliver on the basics, like quality and performance. With a big brand name like Breville, you can rest assured that its products have been created with quality, durability, and performance in mind. 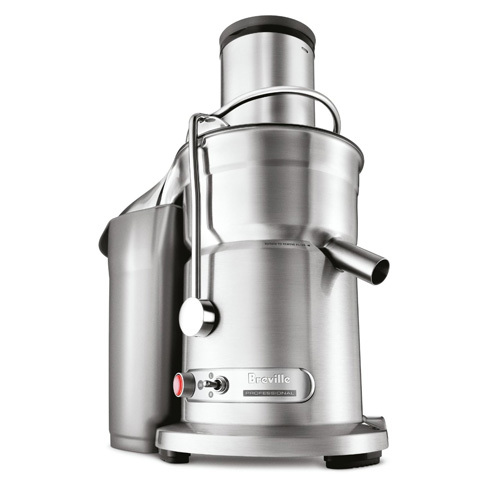 The Breville 800JEXL Juice Fountain Elite takes this a step further. If you are looking for a powerful juicing machine that can produce professional results, with the minimum amount of effort, it’s hard to find anything that does the job better. Breville clearly understands that convenience and ease-of-use are the top priorities for most people looking to purchase a power juicer. The evidence of this is provided in the form of some really useful features, such as an extra-wide feed chute, which is centered directly over the shredding disc. This means that it’s possible to juice whole fruits and vegetables very quickly, without the need for any laborious pre-cutting. As with other Breville juicers, most of the 800JEXL’s parts are dishwasher safe. In fact, all parts except for the filter basket, Nutri Disc and food pusher can be cleaned in the dishwasher. In addition to this, Breville has also helpfully included a cleaning brush with their product, which is ideal for removing any remaining pulp that may have collected in the filter basket or Nutri Disc. Breville’s patented juicing system keeps wastage to a minimum and ensures that your juice contains the maximum amount of nutrients. In addition to this, the fast operating speed and ease-of-use of this machine more than compensate for the marginally lower amount of juice produced when compared to masticating juicers. The powerful 1000-watt two-speed motor included with the Breville 800JEXL makes light work of juicing even the hardest of fruits and vegetables. The titanium reinforced cutting blades shred food with ease, creating a minimal amount of heat and protecting more of the valuable nutrients and enzymes contained in the juice. The Nutri Disc is also positioned directly underneath the feed chute, which allows food to be shredded almost instantly. Most of the noise created when juicing is caused by the resistance of the food going through the cutting blades. Although the Breville 800JEXL is by no means silent, the sharpness of the titanium cutting blades means that fruit and vegetables are processed very quickly, with little resistance. Base unit vibration is another major source of noise when juicing. This is often apparent with some of the poorer-quality, plastic models. However, the Breville 800JEXL Juice Fountain Elite practically eliminates this with it’s fantastic build quality and sturdy die-cast steel housing. In the world of power juicers, much has been made of the difference between centrifugal and masticating juicing machines. There seems to be a constant debate taking place about which type of product provides the better juice. Although a masticating juicer will generally extract more juice from the food inserted into it, high-quality centrifugal juicers like the Breville 800JEXL are catching up rapidly. As juicing machines go, the Breville 800JEXL is certainly well-equipped. Aside from the base unit, the product comes supplied with a large, one-liter capacity juice pitcher, a pulp container with integrated handle, and a cleaning brush. Breville also provides a useful recipe book, which contains all of the information you need to create delicious and nutritious juices. Although the Breville 800JEXL is a centrifugal juicer, there’s no doubt that it’s an extremely good one. The speed at which it operates and the quality of its juice mean that it could sit comfortably alongside many of the professional juicers found in juice bars and restaurants. As one of the most powerful and attractive juicers that Breville produces, the 800JEXL Juice Fountain Elite is an excellent choice.